Famous People who died in Wolverhampton part 1. 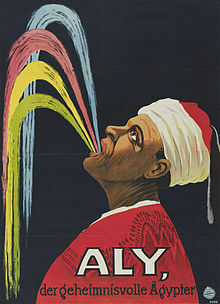 Hadji Ali (c. 1888–92 – November 5, 1937) was a vaudeville performance artist, thought to be of Egyptian descent, who was famous for acts of controlled regurgitation. His best-known feats included water spouting, smoke swallowing, and nut and handkerchief swallowing followed by disgorgement in an order chosen by the audience. Ali’s most famous stunt, and the highlight of his act, was drinking copious amounts of water followed by kerosene, and then acting by turns as a human flamethrower and fire extinguisher as he expelled the two liquids onto a theatrical prop. While these stunts were performed, a panel of audience members was invited to watch the show up close to verify that no trickery was employed. Ali died on November 5, 1937, in Wolverhampton, from heart failure during a bout of bronchitis.